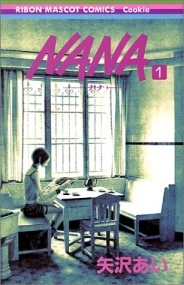 Nana is a popular shojo manga, or long-running comic book series, in Japan. 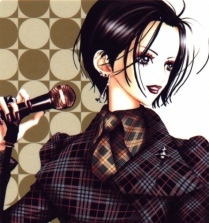 Unlike Paradise Kiss, also by Ai Yazawa, this series focuses less on fashion and more on interpersonal relationships. Our eponymous heroines navigate Tokyo life and struggle to make money and find happiness at the same time; it's not always easy. Shojo (also spelled shoujo) means "girl/young woman" in Japanese, and refers to a distinct genre which has no exact equivalent in English. In one sentence, shojo manga are comics aimed at young women and girls, usually (but not always) with female leads, romantic subplots and story resolutions that involve personal growth. Our story follows Nana Komatsu and Nana Osaki, a genki girl and a punk rocker, respectively. The two are both twenty years old at the series's start, though they could not be more externally different: while Komatsu came from a large and happy family, Osaki was the illegitimate daughter of a loose woman, raised by her strict grandmother. Komatsu is chipper and cheerful and extremely naïve; Osaki is street smart, and a bit damaged by life, but she is nevertheless a cheerful person on the inside. We follow these two heroines through a few years in their lives, through different relationships and break-ups. It can be difficult to follow their different groups of friends, who only expand as the series continues; you may want to write up a chart, or start at the beginning. Before the series starts, both young women have experienced their first heartbreak. Ms. Komatsu fell in love with a (much) older man, who slept with her and then left her after a short while. Ms. Osaki was deeply in love with the bassist for their band; after he was signed on to a major label, they broke up, since he would have to move to Tokyo and a long distance relationship wasn't worth it. This series is a social drama, although style does certainly play a role. We see the characters in their job uniforms, dressed up for shows, on music posters, and more. One sees how different youth subcultures––academic students, musicians, art-school students, service workers, punks, goths, lolitas and so on––interact with each other. Ai Yazawa also deals with personal and psychological issues throughout the series. How can I find a way to do what I love? How involved should my significant other be in my life? Who am I? These issues of late adolescence are dealt with frankly but without prurience. For this reason, I would recommend the book to any young person grappling with these issues him or herself. Although this is a shojo manga, young men will find it interesting as well; the only problem is, there are few male characters which one can easily identify with. If you enjoy identifying with female protagonists, though, this might be the manga for you. Buy Nana at Amazon.com .